We hope you were able to join us for our #FoodTVChat with Clash of the Grandmas contestant, super talented home cook and artist Sandra Sallin because we had a blast! Sandra patiently answered everyone’s questions and her sparkling personality and sense of humor were a delight. If you didn’t make it to the chat, we have highlights below. Enjoy! Sandra was the only home cook on Clash of the Grandmas, competing against restaurant owners and formally trained chefs, so we asked her what motivated her to compete on #ClashoftheGrandmas. Her answer? What is Sandra’s advice to someone who wants to compete on #FoodTV? Sandra writes about her own experience auditioning for #ClashoftheGrandmas on her blog. It’s a great read! 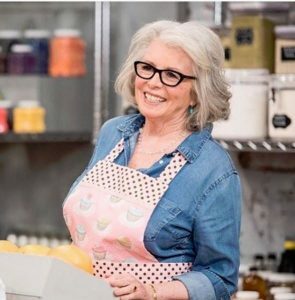 Sandra was totally charming on #ClashoftheGrandma and cooked her heart out. Unfortunately she didn’t win. We asked her what she would have liked to do over. Sandra also noted that the time allotted to prepare the dishes was crazy and that the kitchen was enormous! Sandra also mentioned her mother’s cheesecake recipe as being the best in the world. She shared the recipe and the story behind it on her blog and it does look Divalicious! And speaking of her blog, Apart From My Art, you should check it out and subscribe for updates. Sandra is an amazing artist and a fascinating storyteller! You can also find Sandra on Twitter, Facebook, Instagram, and Pinterest. Sandra, thank you so much for guest hosting #FoodTVChat...we throughly enjoyed meeting you! !